Nearly two years after the Orange Revolution, there are tents at Kyiv's Independence Square (Maidan Nezalezhnosti) again. The camp isn't big, and it looks dormant for now, but as Ukrainian politicians continue to keep the country in limbo, this summer's Maidan seems to be waiting to happen. Or not. (After all the broken promises and mismatched alliances of the past four months, it's not realistic to regard anything as a certainty now.) A just-in-case Maidan. You have a fantastic opportunity to call the Socialist Party of Ukraine regional headquarters and ask why "Moroz has [betrayed] us." Also, it seems reasonable to ask if they feel comfortable working for the head of the party who has betrayed the Ukrainian people. viktoza: I called this number: (044) 573-58-97. Told them: I'm Victor ..., I voted for the Socialist Party in this election, and now I do not understand the actions of your faction. We stood together at Maidan against [Yanukovych], and now suddenly you become his allies. I think you've betrayed me. A Socialist woman replied: "This is what it looks like at first only, that we've betrayed you. In reality, though, you have to know who truly cares about Ukraine. If someone's guilty of what's going on now, it's the president." And then she hung up. In the Kyiv City Committee, I've been told that all the Orange ones are to blame. If they had nominated Moroz instead of [Poroshenko], everything would've been OK. But she couldn't answer the question about why Moroz was kissing with Yanukovych and Kivalov [head of the Central Election Committee in 2004], the men he used to call bandits. I told her, "You are traitors all the same, and I won't vote for you anymore." That was the end of our conversation. 067_33_44_55_6: I don't think it'll work, but I'm writing letters in which I let them know that they can cross me out of the Socialist Party voters list and I'm also wishing them success in further political intriguing. kotyhoroshko: Letters are being read by their [computer network] administrators. Making phone calls to them, on the other hand, is fun. You'll enjoy it a lot. I'm reading today's news and feel the world collapsing. The world that we seemed to have created two years ago. [Victor Yushchenko's Our Ukraine] is in the opposition, Pora lies by the [Parliament's] door, [Yulia Tymoshenko's Bloc] is blocking all they can and cannot, but is it going to help in any way? Yanukovych will be the prime minister. The rest will follow. Kalashnikov [parliamentarian from Victor Yanukovych's Party of the Regions, assaulted a TV crew recently] will head the Freedom of Speech Committee. [Yulia Tymoshenko's Bloc] will continue to block everything and everyone. Russia will lower gas prices for us, potato prices will be lowered focibly, pensioners will get a pension raise that will last one month. Everyone will be happy. My Russian friends will say gleefully: "We did tell you!" And NATO isn't taking us anymore, anyway, and no one's relaxing visa regime for Ukrainians. I'm probably not even going to vote in the next election - there's no use. And if they lay themselves underneath [Moscow], I'd even think about where to leave for. Because I love this country, but I hate this state. rgmss: [...] Actually, all this was showing through. 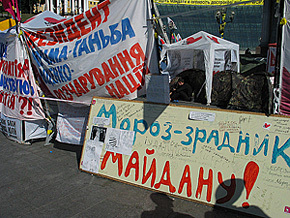 When we were standing and freezing there [at Maidan in 2004], everything was right. But right afterwards it all began to fall apart. When "they" [representatives of the former regime] were all interrogated and then let go... it became clear then. This country needs [Pinochet]. For five years, no longer... just to purge the ranks. And since the situation is ugly enough, there are jokes, of course. [...] this is the simplified version. there’s another, infinitely more colorful, one featuring tymoshenko, but too much would be lost in translation. three famous ukrainian men, volodymyr klichko, andrey shevchenko, and president viktor yushchenko are pushing baby strollers in the park. klichko starts contemplating the future of his progeny out loud. shevchenko then beckons the men to examine his baby boy, who is thrashing about with his legs. “my son will probably become a world-class soccer player,” he says. yushchenko bends over slowly and sticks his head the stroller. "He's shat himself and is silent now."